Following Friday's Free Practice-1, where Rubens Barrichello had crashed mightily, ultimately being ruled out of any further action that weekend, things were about to get worse. 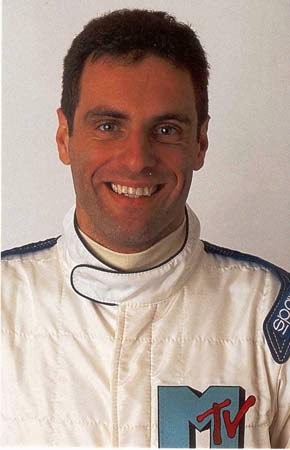 Reportedly, Roland Ratzenberger, who was contesting just his second ever Grand Prix at Imola, was quite proud of showing off his newly acquired blue Porsche 911 Cabriolet, part of his statement of having made it to the pinnacle of motorsports, aka Formula 1. Ratzenberger had made his name by winning the prestigious British Formula Ford Festival in 1986, then becoming a factory BMW Touring Car driver before joining the cadre of aspiring Gran Primo Piloto's in Japan's F3000 series, which included the likes of Eddie "Irv-the-Swerve" Irvine and Jeff Krosnoff just to name a few - with Roland having won at Suzuka in '92. As we know, the young Austrian driver, who reputedly fudged his birth year in order to be two years younger - was attempting to qualify for the San Marino Grand Prix's final grid spot, having gone off-track the lap prior to his death; subsequently damaging his front wing, which the next time round on the high speed portion of the circuit, where downforce was crucial, the wing failed, jamming itself underneath the front wheel and causing Roland to drive straight off the track to his immediate death! Hill was actually still trying to decide whether or not to continue qualifying when Team Willy' (Williams) withdrew, as it would be Senna's very final Pole position - which he didn't care about! Michael Schumacher was deeply disturbed over the tragedy, while J.J. Letho had driven from Monaco with Ratzenberger that weekend. "Heinz 57" (Heinz-Harald Frentzen) had raced with him at Jarma (in Sports Cars) and immediately left the circuit to return to his hotel room, where he said he didn't want to speak to anybody! Absolutely amazed how emotionally distraught Senna was over Roland's death; positively convinced he seemed to be showing his true emotional caring self and even crying in front of Rubino, etc; far from the cold, calculating "Arrogant" who I'd christened him all those years ago. Even funnier yet was that after I'd finally started reading this long dormant book, listening to Speed Freaks one Sunday evening when they were playing an Encore edition, their first guest interview just so happened to be with the bike builder Jesse James telling how he'd been hired as Senna's Bodyguard for the 1989 USGP at Phoenix, Arizona and how STUPID it was hosting a race there in Summertime! As your humble No Fenders scribe was there that weekend when it peaked at 104 degrees-f on race day; SHEISA!